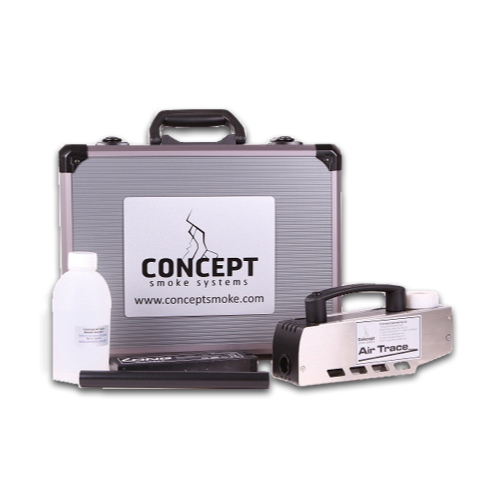 Kit “Concept Air Trace – Hand held battery Smoke Machine” including Concept Air Trace portable low-flow Smoke generator, 500 ml Refill, Battery, Charger with case. The Concept Air Trace Smoke generator ICA 303 stainless steel is specific for the pharmaceutical industry and clean room; the Concept Air Trace Smoke generator ICA 305 in lacquered iron is employed in all other industrial applications and ventilation. 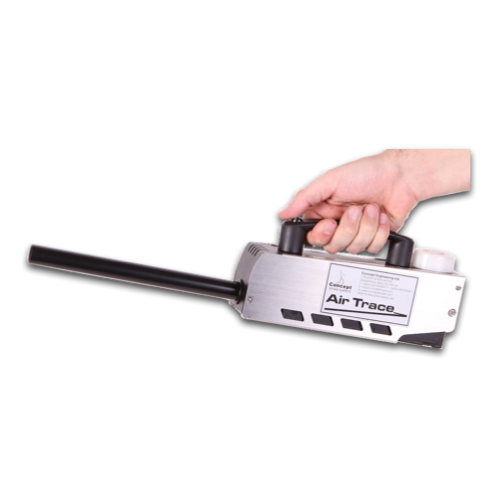 Concept Air Trace – Hand held battery Smoke Machine is a low-flow portable Smoke generator ideal for tracing local airflows and for flow visualization. The Air Trace Smoke Generator is the Concept’s smallest, lightest and more practical smoke machine, perfect if you require just a small volume of smoke, and have no mains power available: it runs from a 12v DC battery. It is capable, if required, of producing a steady stream of smoke for up to 10 minutes from a fully charged battery, or you can use the Air Trace continuously if connected to a mains adapter. The fog produced is designed to disperse quickly. the Air Trace S (in stainless steel). The Air Trace S (ICA 303) has been developed to cater for pharmaceutical industry, cleanrooms and controlled environments, while the Air Trace Standard (ICA 305) is used in all other industrial applications and ventilation. This is the best available solution on the market in all situations where it is required a small amount of smoke for non-toxicity, ease of use and operating costs to highlight airflows and LEV (Local Exhaust Ventilation) issues. Download the Air Trace Fluid Safety Datasheet. WARNING: the smoke fluid and the battery included in the package are considered consumable parts, the battery is subject to a degradation that typically occurs within a year, no warranty is given about the battery, but you can purchase an additional battery. Alternatively you can purchase a mains adapter. You can also purchase the Air Trace Smoke Fluid refill bottle.